Amazing skirt and awesome ring!!!! I love your outfit! It’s amazing! Your skirt and earrings are superb!! You look so classy and elegant….I really like your sunglasses and the skirt! Amazing photography!! Love your elegant ladylike look!!! Very glam veronica, beautiful and elegant! Absolutely LOVE the skirt and how you wore the cardigan backwards…so ladylike and chic! 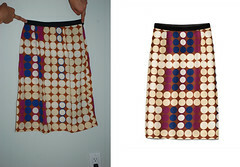 absolutley amazing skirt! great pictrues! what a pretty skirt! and such a great outcome! Stunning outfit! I like the skirt and clutch! I’m so used to see you in very clean lines… the pleated skirt was unexpectedly gorgeous! Love the Dior-esque factor! WOW! LOVE THAT SKIRT !!! G R E A T ! love this outfit!! you look amazing! Oh, gorgeous. The cat eyes work for you…as does the whole ensemble. You are ELEGANT !!! If you like the parisian fashion don’t miss my New give away ;) ! What can i say? gorgeous! This skirt is magical! You look gorgeous! You look stunning! Sooo elegant! Superba!Totul e perfect,si ochilarii ii ador! what an amazing skirt you have!! It looks perfect on you! and WOW!! you are looking super lady and stunning in here.. Im loooooovig it! There’s noone else that can pull off the metallic trend as perfectly as you my sweety! Looking gorgeous! Chic in a very vintage like cinematic flair! Gorgeous outfit! Love the pleated skirt!! You are incredibly chic and elegant in this outfit. Everything is great. Love your skirt. love your earrings and the clutch a lot! lovely outfit. That skirt is a dream. Oh my!That is the best skirt I’ve seen lately! Hello happy day. Beautiful look Veronica love your skirt. I received the skirt last week. It looked nothing like the one pictured on the website (comparison here: http://farm8.staticflickr.com/7137/7581030976_45cf846cd6_m.jpg). I sent photos to sheinside.com in an attempt to have them authorize a return of the product I received, but their customer service representatioce claims that “it’s actually the same as the website shows”. I hope my bad experienec is unique, but I thought it would be fair to your readers to be aware of this website’s practices. the first photo is absolutely amazing sweetie! really nice outfit with retro vibes! great! Wow, I love the skirt! The whole outfit actually! You look stunning! Breathtaking actually! You look so fabulous – like a 50s retro diva! Love how you styled your hair!Awesome way of wearing cardigan – looks so good with metallic pleated skirt! I die for your flea market earrings! Absolutely elegant. I don’t have other words…Veronica, this ensemble and the picture are simply amazing! This was absolutely beautiful – one of the best blog posts I’ve seen.